The Continuum Ensemble, one of the U.K.’s leading contemporary music groups, is based in London and dedicated to performing new and neglected music from the 20th and 21st centuries in order to enrich and enhance audiences’ knowledge and enjoyment of modern music. They have earned consistent praise from critics and audiences with performances in concert programmes, operas, festivals, radio and television broadcasts and cd recordings including over 40 world premieres and 35 U.K. premieres of music by leading composers of our time. Led by co-artistic directors Douglas Finch, pianist/composer and Philip Headlam, conductor, the ensemble has performed at the Spitalfields Music Festival, BMIC Cutting Edge, New Iberia Festival, Quebec in Motion Festival, Kettle’s Yard, Cambridge and at venues including the Purcell Room (Southbank Centre), The Warehouse, Almeida Theatre, The Coliseum, Linbury Studio, St. Gile’s Cripplegate, Union Chapel, Christchurch (Spitalfields), Old Royal Naval College, Blackheath Concert Hall and Wilton’s Music Hall. Concert series include 20th Century Views, Crossing the Divide, Elementary Secrets and Music of our Time featuring music by U.K., European, American and Canadian composers including Simon Bainbridge, John Casken, Alexander Goehr, Oliver Knussen, Colin Matthews, John Tavener, Judith Weir, Julian Anderson, Luke Bedford, Richard Causton, Julian Grant, Kenneth Hesketh, Errollyn Wallen as well as Denys Bouliane, Pascal Dusapin, Henri Dutilleux, Gerard Grisey, Christobal Hallfter, Elliott Carter, John Harbison, David Lang, Frederic Rzewski and Dallapiccola, de Falla, Ligeti, Ravel, Scelsi, Stravinsky and many others. Others series include Swept Away, five concerts at Kings Place, London devoted to the music of the lost generation of composers in 1920s Germany who were persecuted by the Nazis and swept into exile by 1934. Concert programmes of opera, chamber, choral and orchestral music by Ernst Toch (many performed for the first time in the U.K.), Kurt Weill, Ernst Krenek, Paul Hindemith, Stefan Wolpe and cabaret song composers Mischa Spoliansky and Friedrich Hollander were featured with outstanding soloists and the BBC Singers. Talks and events by leading experts on the German musical emigres, art, film and literature of 1920s Germany and refugees artists in the world today added background to the rediscovery of lost music from this witty, sophisticated golden era of the early 20th century. The Southbank Centre was the venue for Recitations and Conversations, a festival of exciting, imaginative music and music theatre from 1980s Paris by composers Georges Aperghis, Pascal Dusapin and Tristan Murail; all three concerts sold out. Others include a Gamelan Music Festival with music by Lou Harrison, Claude Vivier and Jose Evangelista hosted by the Spitalfields Festival, Improvisation: Tradition and Innovation featuring performances and workshops over three days including Douglas Finch’s peerless improvising skill at the piano, organist/composer Naji Hakim and Cornelius Cardew’s monumental graphic notation score, Treatise and a 90th birthday celebration concert of music by one of the greatest French composers of the 20th century Henri Dutilleux at the Southbank Centre and in Cambridge which the composer attended. 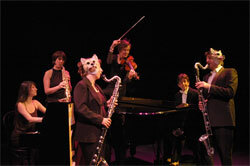 The Continuum Ensemble has performed chamber opera productions including El Cimarron by Hans Werner Henze (in co-production with English National Opera - Contemporary Studio), Little Red Riding Hood by Georges Aperghis with Almeida Opera Festival as well as White Rose by Udo Zimmermann and Nenia, Death of Orpheus by Harrison Birtwistle. TCE has broadcast numerous concerts on BBC Radio 3‘s Hear and Now and Morning Performance and received enthusiastic reviews for two cds of music by Roger Smalley and Errollyn Wallen on NMC and Avie labels.They recorded the score for Judith Weir’s opera, Armida commissioned by Channel 4 and broadcast television broadcast across the U.K. as well as the soundtrack for the film, Painted Angels, released in 1999. Soloists and artistic collaborators include singers Donna Bateman, Anna Dennis, Barbara Hannigan, Jane Leslie Mackenzie, Patricia Rozario, Marie Vassiliou, Lore Lixenberg, Rebecca du Pont Davies, Geoffrey Dolton, Gary Magee, Barnaby Rea, Andrew Rees, Sarah Tynan, Keel Watson, violinists Simon Blendis, David Le Page, Mieko Kanno, Hugo Ticciati, cellists Jerome Pernoo, Matthew Sharp, Joseph Spooner, flautists Kate Lucas, Lisa Nelsen, pianist and composer Huw Watkins, percussionists Colin Currie, Chris Brannick, actors Joz Houben, Simon McBurney and directors Annabel Arden, Mike Ashman and John Lloyd Davies. Education work includes music improvisation workshops, composer-led workshops in London schools featuring creative composition and song writing, a national improvisation competition for students, collaborations with Trinity-Laban Conservatoire and Royal College of Music, pre-concert talks with composers and performers as well as leading experts on concert programme related subjects. ‘excellent performances from The Continuum [Ensemble] players, in fine recorded sound.